Today is the halfway point of winter. If you live where it is sunny and warm….then you likely aren’t struggling through the days like the rest of us hoping for a peek at the sun and maybe a day with temperatures above 30 degrees. Here in Iowa, the last few weeks have been foggy, dreary, rainy, and snowy. Pretty much miserable. We did have a nearly 50-degree day once, but it was so foggy that you couldn’t really enjoy it. Plus we hardly have any snow where we live, so everything is muddy and dismal…not the pretty winter scene that you imagine. I’ve also been sick twice in the last week, once with the stomach flu and now a cold with the addition of a middle-of-the-night migraine. So, to say I’m ready for winter to be over is an understatement. Modern Mrs. Darcy asked bloggers to brighten your day today, by sharing “What is Saving My Life Right Now”. A list of things that are getting us through these short (but feel long), cold winter days. Books – This is an obvious one. But, what is especially helpful is that I have multiple books going at once. That way I have a book to fit every mood. Do I just want to read a couple chapters? Do I want to immerse myself in a story? Do I want to learn something? 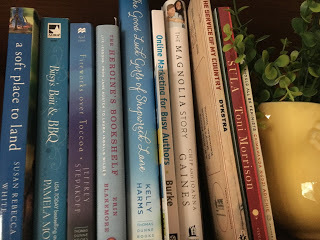 I’ve got a book for every mood as well as every reading location including physical books, eBooks, and audiobooks. 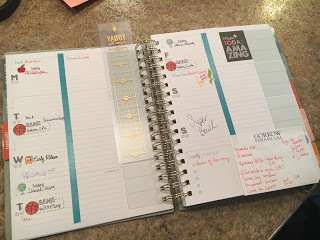 My InkWell Press Planner – cLife right now is hectic. I’m gone several nights a week for basketball games, On the weekends we are attending show choir competitions. I’ve been subbing a lot. And I have numerous to-do lists going through my head every single day. Prom is just a little over two months away and I have so much to get ready. My planner is keeping it all together for me and making sure I don’t forget anything. This Blanket – is amazing. I could sit in the chair under this blanket all. day. long. One side is a soft velour and the other is a warm fleece. It’s the best of both worlds in one blanket. My Devotional – My friend gave this to me for Christmas and it is crazy how each day seems to apply to my life or someone close to me. The insight is calming and just what I need to hear. Bark Thins – A friend of mine told me about these dark chocolate goodies. I had seen them before but wasn’t sure I would like them. I tried this Dark Chocolate Toasted Coconut with Almonds and was hooked. It’s like eating an Almond Joy. I keep them in the van when I need a snack. 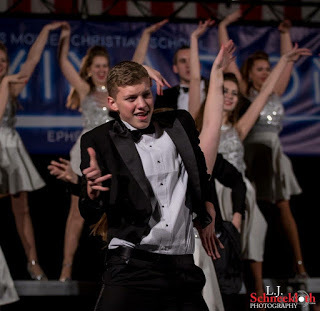 Watching Our Kids Perform – We are heavy into the show choir season in our house. Every weekend is booked traveling to a school to perform and then waiting to see if we made finals. If you don’t have show choir where you live, then you probably don’t get how awesome it is to watch these kids perform. It’s one of our favorite things to watch the kids do and I just love this year’s show. Even though it makes for crazy schedules and late nights, it is all worth it. My Husband – I am so thankful that I am in a marriage that is 50/50. If I am subbing or volunteering or finishing a deadline, I know that I can count on him to make dinner, get the kids from school, do laundry, or stop at the store without question or complaint. He has always been hands on and doesn’t look at roles defined by gender roles. So, when I am a little swamped, I know he has my back and things will still get done around here. Especially with me being sick lately, he has gone above and beyond to help out. This is what is saving my life right now. Things can get pretty hectic around here, but as long as we have each other’s backs and have fun, we will make it through. What is saving your life right now? Feel free to share it in the comments! 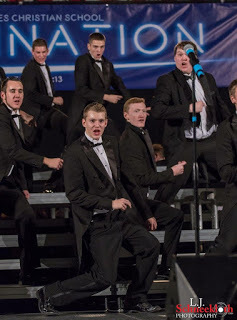 Oh, show choir! How fun! I loved show choir when I was in school. My oldest is only six, but I have a feeling he may head in that direction. He is thrilled to start theater classes this month.